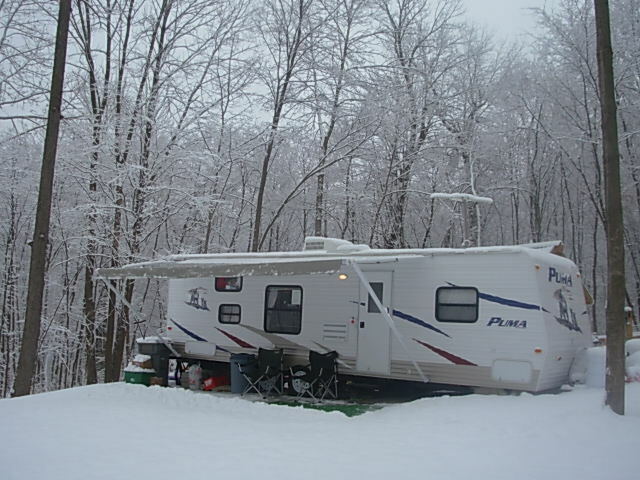 In 2007, my husband and I sold our house near Minneapolis, Minnesota, purchased 11 acres of land right outside of River Falls, Wisconsin, and had a 27 foot Palomino Puma travel trailer dropped into the woods that we decided to call home. One of the first things that confounded me about travel trailer living was how we were going to dispose of the “black water”, which is travel trailer lingo for human sewage. We had organized and read about so many things but had not gotten to that incidental. We did have a little time to investigate the best practices of sewage removal, being that the travel trailer tank could take a couple of weeks to “fill”. We purchased the travel tote at a camping store near Rogers, Minnesota. The wheels were supposed to make getting from here to there easier. I was not quite sure where “there” was yet, but we would find out soon enough. It held approximately 18 gallons of liquid and was on sale for around $125 US dollars. We came across a dumping station that was conveniently located about 10 minutes from our property, where one could dump black and grey water for the bargain price of $2.50. Now that I was clear on the destination of our tote’s future contents, we were ready to take the plunge and say, “Let it be filled”. The following are directions by Mark Robinson, ehow.com. on how to empty the travel trailer’s black water tank: (Please skip the bold print unless you are hoping to take a nap sooner than later). Find the black water tank drain port on the travel trailer. This port is normally located underneath the trailer on the same side as the toilet and near the black water tank. Remove the cap from the drain port. Attach one end of the RV sewer hose to the drain port, making sure that the hooks on the end lock onto the tabs on the drain port. 3. Feed the RV sewer hose to the dump hole. 4. Attach the drain fitting onto the other end of the hose and place it into the dump hole. Locate the drain release lever near the black water tank drain port and open it. The tank will proceed to dump its contents. Close the drain after you stop hearing the black water draining from the tank. 5. Detach the RV sewer hose from the drain port. Use a garden hose to flush out any remaining black water residue from inside the hose. When finished, disconnect the drain fitting and remove the hose from the dump hole. I am not sure if having those directions could have changed the unfortunate course of events that were about to unfold, but the first couple of fills and dumps were very challenging. The substandard hoses and connections that were included with the tote were not giving us the secure seal you would look for in something that transports “this” type of liquid. We had leakage issues in the car on the way to the dump station and some embarrassing spillage while dumping. Now we progress to a cold day in mid-November. I do not know the exact date, but time was being noted by how many days we had left to return the poopy tank. It had a 60-day return policy, and we all agreed that the tote needed to go back. We had grown tired of its cheap parts and seeping crevices, but we needed its services one last time. My husband was once again trying to attach the annoying sewer hose to the drain port while the girls and I watched from the back travel trailer window. The process was proceeding in the usual way; my husband’s tremendous frustration and curse words silenced with the closed windows, while he wielded clamps, hoses, and the tote simultaneously. And then it happened.. the small cracks and weak seals in the sewer hose finally gave way with an appalling force, spraying everything in its path. The trees, the windows, the nearby shed, the chicken coop, and my husband were all showered with sewage. Oh, so very uncivilized. Ah yes, the journey through new adventures. I totally get you. I would say I like this, but it is too awful to use that word. This is a totally foreign subject to A LOT of people, hysterically funny to some of us. Of course, only after a long time from the event. Denise, you say you and the girls watched in horror, which I beleive you did, but my recollection of the story is that you and the girls also laughed histerically as you remained in the safety of your trailer. Don’t try to deny it:) Thanks for another good laugh.